Royal Enfield's contribution to beating the Axis in World War II naturally included the production of motorcycles, including the Flying Flea, the parachute dropped motorcycle that accompanied airborne troops into battle. But the firm also contributed many other products besides motorcycles, including ammunition. Most intriguing, Royal Enfield operated an underground factory in the Wiltshire area, far from the headquarters factory at Redditch. 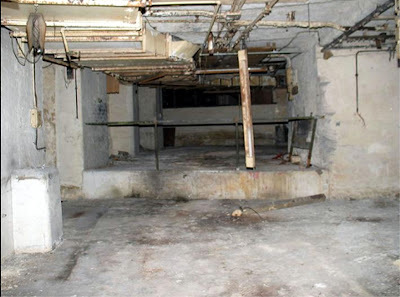 You can see pictures of the deteriorated factory on the Underground Kent site. Safe from Luftwaffe bombing, this subterranean plant in the galleries of the former Westwood Quarry was cutting edge technology. It was among the first fully temperature and humidity controlled space of its size. In other parts of these immense underground caves, precious paintings from Buckingham Palace and the British Museum found a haven. It was rumored that the Crown Jewels were there, too. After the war, Royal Enfield did build motorcycles in its underground facility, which was no longer needed for defense work. But what had the company built there during the war? Surely not the side-valve motorcycles it was selling the War Department. Not in such premium space, next to paintings from the palace. A Royal Enfield brochure from the immediate post-war period, shown for sale on eBay, may offer clues. In addition to touting motorcycles, the brochure proudly details "Our Wartime Record" and offers what it says is a "complete list" of goods the firm produced for the fighting forces. Motorcycles, 125cc, 250cc, 350cc, 570cc. Predictors for Bofars anti-aircraft guns. Oil motors for Bofars gun; ships stabilisers; searchlight controls; fuse setting, etc. Diesel generator sets for wireless stations. Electrically-driven generator sets, for testing aeroplanes and radar equipment. Resetter boxes for gun sights. Gyroscopic sight for Oerlikon and other guns. Anti-vibration mounts for gun sights. Armor-piercing shot for 40mm anti-tank guns. Petrol-driven pump units for tank turrets. Straight-line cams for use in precision instruments. Self-synchronising equipment for 40mm guns. Lag-compensating and self-sectoring equipment for gun sights. Tubular crates for enclosing motorcycles to be dropped from parachutes. But what are "electrically-driven generator sets for testing aeroplane and radar equipment"? Oil motors for guns, stabilizers and searchlight controls sound pretty mundane, but when this extends to "fuse setting" and "etc." you begin to wonder. People who know more than I do about weapon systems may be able to identify what among the predictors, gyroscopic sights, resetter boxes, lag-compensating and self-sectoring and self-synchronizing equipment would be worth building in a secret factory. As to your list of war items produced: The "electrically-driven generator" was probably what might be known as a dyna-motor. This was essentially a dc generator belt driven by an electric motor. Since aircraft electronics required, what I believe to be at the time, 28V DC. A motor powered by powerline voltage could used to drive a 28V generator whose output could then be used to test 28V aircraft equipment that had been removed from the plane. Excellent! Now we're getting someplace. That sounds like an important piece of equipment but not something you couldn't get somewhere else, so probably not worth making in a bomb-proof bunker. So, what else on the list looks victory-critical to you? Lots of this stuff relates to the 40mm Bofors anti-aircraft gun. Was it a high-priority weapon? Who knows? Situated In an Old Stone quarry near Westbury 1942. until 1970. Mostly equipment for AAA batteries known as preditors for ascertaining height & siteing. Most staff were transferred from Redditch lived in Prefabs.